Posted on October 16, 2008 at 12:27 am. After getting back from Tianmenshan, we had lunch at the city and I prepared for my afternoon train to Guangzhou. Another train I thought. 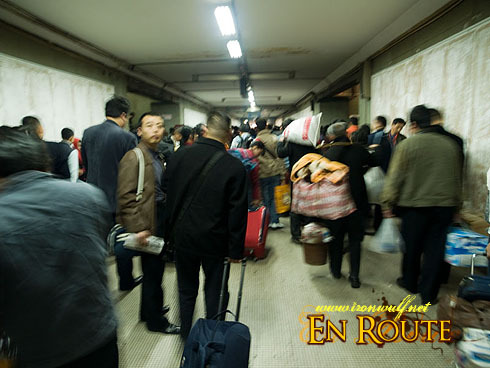 I survived my last train ride from Chengdu, I think I can take another one. Initially I wanted to get my own soft sleeper on this train but the tickets were all sold out the night before, so I had to take the hard seater again. I had no choice if I want to get home in time for my flight the next day. Taking a plane was way too much of what’s left on my budget. 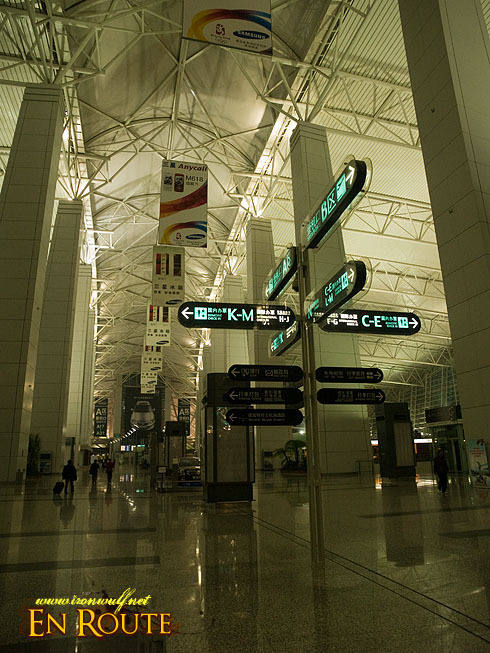 So the night before, we purchased the 178RMB train ticket to Guangzhou. 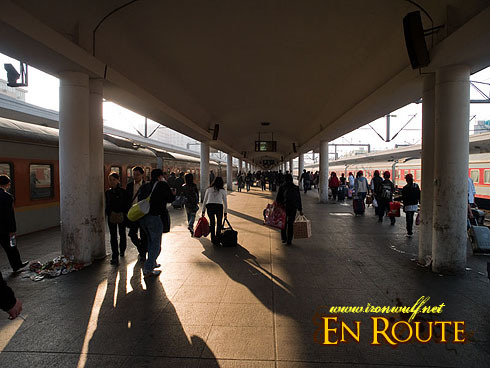 The train station is only a short taxi ride from our hotel. So I bid my friend good bye since he still has more than a few weeks to explore the rest of the China before he goes back to Singapore. The warm afternoon sun glinted among the facade of the train station. It’s a nice looking train station and wasn’t as crowded as the one in Chengdu. I easily found my way through and while walking parallel the railroad tracks on the platform, I came to a realization I’ll be on my own. I wonder how the rest of this trip would go. A place where no one can understand me, and me not knowing any Chinese at all. I wished that the train cart I’m going to would be spacious and comfortable. But as I set in, I find it was already packed. I searched through my seat number and found myself seated in the middle of a three seater row. Just my luck. I placed my large bag at the top overhead compartment and had my other small important bag always beside me as I squeezed in on my seat. The rest of what happened earlier in the train before it took off at 5pm, I wrote on my other entry for the Chinese-Filipino Digest Tulay. But that wasn’t the end of it of course. This is a 14 hours train ride, a lot longer than the previous one and and being alone changed much. I remember having read all the text that was possible to read in the Nihao Inflight magazine I had. I should have really brought a book with me always for trips like this. Going to the restroom, I try to be cautious and kept sight of my stuffs. I remember buying those packed dinner just by waving my hand and pointing at them, giving a large bill since I don’t know how much was it. I don’t even know what’s inside but it turned out real good. The dinner was rice topped with vegetables, a few meat and tofu. Satisfying my thirst with a hot drink from the bin since I wasn’t able to buy water. My MP3 player dying halfway through the journey. How amused my Chinese seatmates were when I folded my packable Columbia jacket into a pillow for me to sleep on. 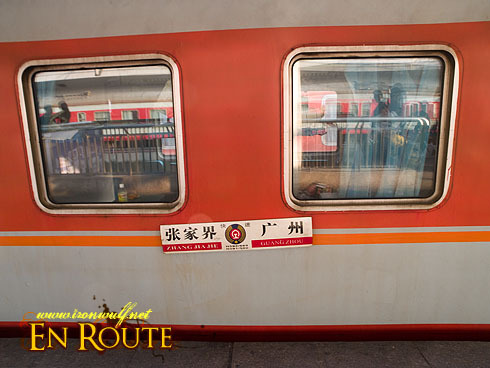 By morning at the train, as I observed the Chinese would start brushing their teethes at the sinks and washing their faces. As we approach Guangzhou I could see the large factories far from the field and the thick abounding mist again. I’m a bit tired and just wanted the train to arrive at the station already. At about 7am, I was finally able to stretch my legs fully as I walk along the platform of Guangzhou Northern Train Station. Going out was slow as the lower pedestrian tunnel was filled up with people. The exit was also slow as the guards had to check the train tickets. I felt relieved getting out of the train station and welcomed by a number of high rises and buildings. I quickly crossed the street and had my breakfast in Mcdonalds since I was so so hungry. I wanted to visit Kaiping Dialou, south of Guangzhou before I headed to the airport but had trouble at the bus stations since I couldn’t read anything. Everything’s in Chinese. I know how to get there in English but I can’t read Chinese. I tried asking the lady with information sash around her but only pointed and tried hard to speak English but only lost into indiscernible murmurs. I tried to ask other people but it only frustrated me that I just walked the streets and looked for a hotel. For sure there are people who could speak English there. Guangzhou is a haven for shopping. Most of the stores are filled with bargain clothes stores even the underpasses were. I finally found a hotel and talked to their customer assistance desk to ask where the bus going to the station was located. She spoke in fluent English and gave me clear directions which I was thankful for. It was a couple of blocks away until I reached Mariott Hotel and again asked about the Bus going to the airport. It was just across the street and the guy there even pointed at me. It was a relief just to find it and gave me enough time to just roam around for a while. Starbucks in China always have free wifi. Stayed there the morning to research in going to Kaiping only to find out I no longer have time. I learned that I should have a Chinese phrase book or print outs of the chines Characters so I could just show them to people there. It would be a lot easier. I just decided to stay at Xue xiu Park just nearby to spend the afternoon. 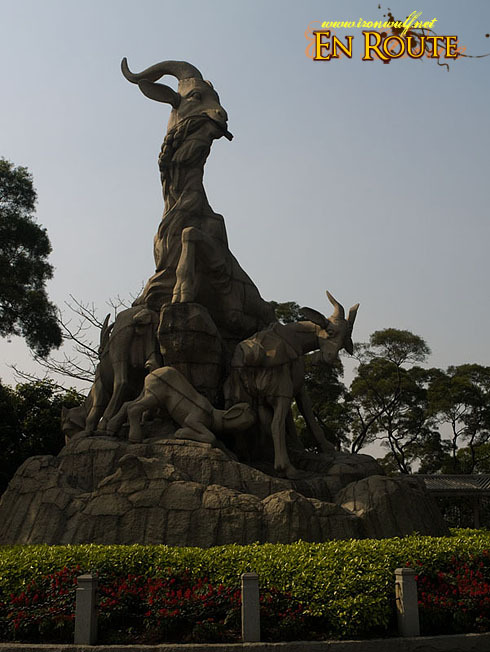 In the park, you’ll find the 5 Ram statue which is the symbol Guangzhou. The park is pretty huge but it’s well made. Not much to see for me here except for the more amusing English translated signs there. 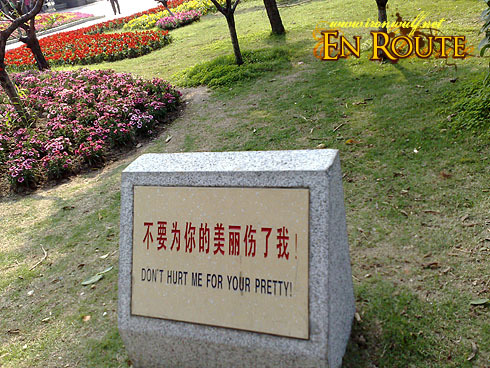 From the “don’t hurt me for your pretty” or the more hilarious “Don’t feed me with your privates” at a fish pond. I could feel the toll of the bags I have. It seems I was already tired and felt them to be a lot heavier than usual. Near 4pm I headed to the Airport Shuttle and headed to the airport. 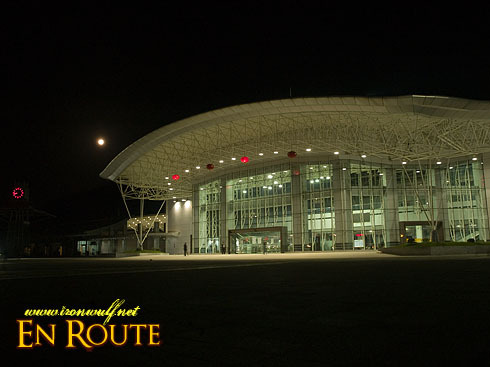 I finally was able to see Baiyun Airport in broad daylight and was once again amazed at its immensity. At the airport I met other Filipinos on their way home. I found myself talking more than usual to two Pinays there who came from a 25hours train ride from Beijing. Wow! that’s more than a day. Perhaps I missed speaking in tagalog already that I easily spoke to these two Ifugao born quickly. They are OFW workers heading home and I found a sort of our bayanihan trait of sharing excess luggage capacities to those who needed them. I spent the rest of my Chinese currency for pasalubong and waited for the plane to arrive. 11 days in China. Who would’ve thought I can get here and visit all those places. It was a pretty adventurous ride for me but I’m also excited to go home now. I like how you portion out this China series. You’re right, giving us a dosage here and a dosage there beats the monotony. Again, it was one heck of a trip, and I am just reading it. I am glad that you had this trip. Hopefully, I would get lucky someday too. All in all, what was the cost of the trip? wow, what an adventure i missed, wulfriend. i can imagine the horror of being alone in a place where no one much knows english. oh, and the hard sleepers and squat toilets plus the exotic cuisine. that is quite an adventure Ferdz. those Chinese translated into English signs are really an entertainment for me. Kahit sa mga e-mails andaming forwarded na ganyan. Naloka naman ako dun sa “don’t feed me with your privates!” Sayang di ka nakapunta sa Kaiping Dialou. Charl went there and told me quite about the place. If i am not mistaken, it’s a Unesco Heritage Site. you have a very nice way of documenting your travels. You’ve documented even the littlest details, ang galing. so where’s your next adventure? Laos na ba? sarap bumyahe! ferdz astig ka talaga! im also proud as i was able to complete the china series. ganda kasi talaga. walang boring na post lahat may adventure kasi iba ang kultura. sa mga post mo para talagang kami nasa train din. salamat sa mga pictures ferdz at iba rin talaga pag ikaw ang nagdadala sa amin sa mga ganitong lugar. “I remember having read all the text that was possible to read in the Nihao Inflight magazine I had. I should have really brought a book with me always for trips like this.”>>> oo nga. kaya ako sa byahe ko may dala talaga akong at least tatlong travel magazine. kahit kung minsan mabigat pero kasama na talaga sa bag ko yon. Interesting trip Ferdz. Never been to China but the photos you took kept and put me in awe. I’d like to visit there someday. It’s a beautiful country, definitely. Looking for your next travel series. Hi Photo cache, glad you appreciate the random jump from one destination to the next. After my computation, I spent less than 30k and it could go less if not for the unforseen events. I will post a much detailed IT onthe China chronicle in future posts. So far, it’s one of my most memorable travels Oggie. Surely something I’ll remember for a while. Glad you appreciate the China Chronicles Dom, kahit 11 days lang really exciting din talaga. naku after this, I’ll make sure to always bring reading materials mat the trip be long or short. I hope you’ll get your chance Kyels. Thank you very much for seeing it through. I haven’t been by for a while…I like this post. I get to know China more…now on to browse the posts I missed.